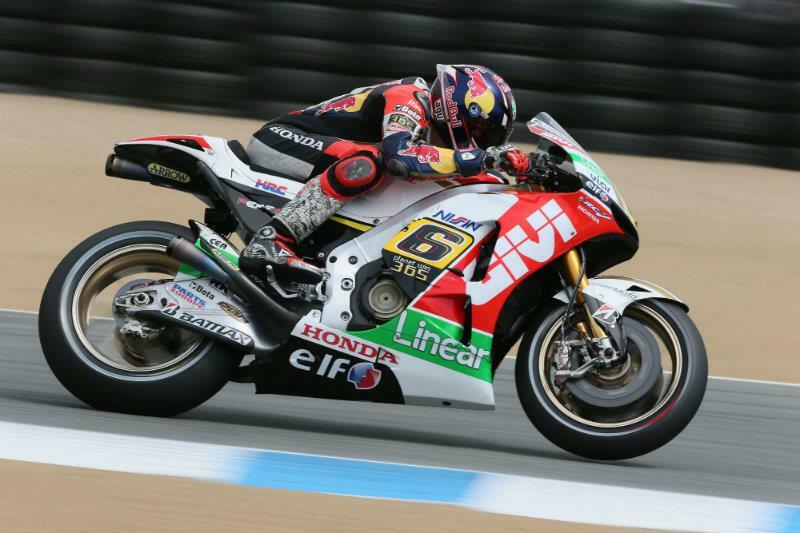 LCR Honda rider Stefan Bradl stormed to a career first MotoGP pole position in dramatic fashion at Laguna Seca this afternoon after a late crash denied Marc Marquez top spot in qualifying. Bradl’s 1.21.176 at the end of the 15-minute QP2 denied Marquez what had looked like a certain fourth pole of his rookie season by just 0.017s. Repsol Honda rider Marquez had made a mockery of his lack of experience on the short but technically challenging and physically demanding California venue, and the only time prior to QP2 that he had not headed the timesheets was in yesterday’s opening practice session. Having dominated the next three sessions it was no surprise to see the 20-year-old dominate the majority of qualifying. But as he picked up his pace to try and improve on a 1.21.193, he lost the front-end of his factory Honda RC213V and crashed out unhurt at Turn 6 in the final stages. Bradl’s pole wasn't the only major shock in today’s qualifying session, which took place under gloriously sunny California skies. Gresini Honda rider Alvaro Bautista will start the 32-lap race from the front row of the grid for the first time this season after a lap of 1.21.373 put him just 0.045s clear of Valentino Rossi in fourth. It was a massive improvement for the Spaniard, who in the previous eight races has only qualified on the second row twice. British rider Cal Crutchlow’s weekend started in positive fashion yesterday morning when he logged the fastest time in a cool and cloudy FP1. But it has been hard work since for the Monster Yamaha Tech 3 rider and today was no exception. Crutchlow, who fell heavily but unhurt at the third corner in FP4 earlier this afternoon, had a nightmare start to qualifying when his YZR-M1 suffered a technical failure just as he was poised to the leave the pits. The British rider, who had been the only one to finish ahead of Marquez all weekend prior to QP2, lost almost 10 minutes of the session. The 27-year-old eventually posted a best time of 1.21.420 to finish just 0.244s off pole but his fifth position on the grid is his worst of the 2013 campaign and the first time he has missed the front row since last month’s Mugello round. Reigning world champion Jorge Lorenzo, who is recovering from two big operations on his left shoulder in two weeks after costly crashes in Assen and Sachsenring, will start sixth after a best time of 1.21.453 was only 0.033s behind Crutchlow. This afternoon’s session was an incredibly close affair with Bradl on pole and Lorenzo on the back of the second row split by just 0.277s. Repsol Honda rider Dani Pedrosa will start seventh after he managed a best lap of 1.21.728. Pedrosa didn’t ride in FP1 or FP3 to save over stressing a painful left collarbone he fractured one week ago in Germany. He was only 0.552s behind Bradl and the mission for both Lorenzo and Pedrosa will be to pick up as many points as possible to not lose too much ground in the title chase to on form Marquez. The reigning Moto2 world champion will start tomorrow’s race with a slender two-point advantage over Pedrosa.